By now I am sure everyone knows that Britain has a royal wedding coming up. Prince Harry, grandson to the Queen of England is marrying Meghan Markle an American commoner (that means she is not of royal blood therefore "common"). So you think Disney fairytale right?? Hell no. I was shocked by all the rules and protocol that she will have to follow just to marry her Prince Charming. I was especially outraged with Number 7 (see below) as it pertained to Prince William and Kate. In fact, rules are so important to the Royals that Buckingham Palace had released a whopping 22 page "etiquette book" making sure everyone knows the rules... guests, staff and most importantly the bride. And you know this is just the beginning. I mean this is one tough mofu of a family she is marrying into. But if Meghan wants to be marrying her Prince she better be prepared, for as we have established Disney has failed miserably warning us what lies behind the castle gate after the sun goes down. 20 Royal Rules You Need To Know Before You Marry A Prince. 1. Prince Harry needed written permission from his grandmother the Queen to get married. Any Royal within six in line to the throne needs written permission from The Queen to marry. We certainly know the old tradition of asking the bride's father for permsision to marry their daughter BUT can you imagine you needing a permission slip from your Granny? 2. Meghan Markle will have to be baptized into The Church of England before the wedding. Religion is most important to the British monarchy, in fact much blood was spilt over what the official church of the UK should be. King Henry VIII famously created the Church of England after he was banned by the church from divorcing his first of eight wives. So anyone marrying into the Royal family must convert to The Church of England. Meghan attended a Roman Catholic school, her father is Episcopal, her mother Protestant and she was married to a Jewish film producer. I am thinking taking on a new religion will not be a biggie for Meghan. I had a good friend who converted to being Jewish, it took her years of Hebrew school. I am guessing Meghan will be fast-tracked with no classes, tests, and no chance of Rabbi Greenblat failing you twice (true story). 3. Once married she must give up all political involvement including voting in any election. The Royal family must be seen as neutral in the world of politics. She also will need to be become a British citizen. If only she could find two British people to sponsor her??? 4. Say Ta-Ta to all personal social media. So long Facebook, Twitter, her 3m+ Instagram followers, Meghan is not allowed any personal social media accounts. They all have been shut down. Too bad as I personally will miss her moving Snap Chat stories, like this one. 5. Once married Meghan will lose her last name and take on a title. Usually some new brides take on a new last name but in Meghan's case she will be losing one. Generally members of the royal family do not carry last names. So instead of taking on a last name, she loses hers and inherits a title. If she actually needs a last name and maybe this is a question for Cher or Madonna she’ll be able to use Mountbatten-Windsor on official documents like a passport. Although not officially confirmed until after they wed but it is believed that her new name will be Her Royal Highness The Duchess of Sussex and must be addressed that way in all official outings. 6. The Queen sends out the invitations. I am guessing this is so Buckingham Palace has no surprise invitees that Meghan is hoping to sneak through the servants entrance. The Queen requires total control. 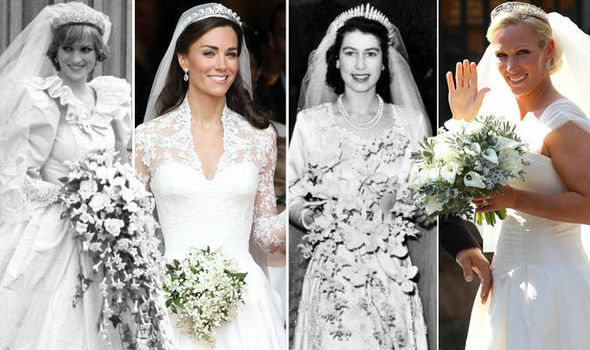 Royal bridesmaids have historically been younger girls within the royal family. It is likely that William and Kate's children Princess Charlotte will be a bridesmaid and Prince George a pageboy. All bridesmaids wear white like the bride. Not certain if Meghan will have a Maid of Honour like Kate did with her sister Pippa. However, Kate (and this to me is insane) was not allowed be the Matron of Honor at Pippa's wedding. Why??? Because "It's unbecoming for a member of the royal family (Kate) to walk behind a commoner (Pippa)", Her own sister!!!! Geeze, seriously??? Mind you, Pippa did upstage the bride. Kate might still be put out. This tradition began with the Queen's late mother in 1923. 9. The Bride's bouquet must include a sprig of myrtle. This dates back to the time of Queen Victoria when she was given a myrtle plant from her husband Prince Albert's German grandmother. It was planted at the couple home on the Isle of Wight and since then royal brides have had a sprig of Queen Victoria's myrtle plant for good luck. But Meagan can forget about throwing that bouquet to all the single ladies. Another highly "suggested" rule is that the bride leaves the bouquet on the Tomb of The Unknown Soider. As that is in Westminster Abbey, not at Windsor Castle where they are marrying it is believed that the bouquet will be delivered there and placed on that tomb. 10. Meghan has been assigned a 71 Year Old Royal Wedding Planner. Dreams of pouring over Bride Magazine and Martha Stewart Weddings with your BFFs as you plan your big day are flattened. The person responsible for orchestrating most of the "big day" is 71 year old William Peel, Lord Chamberlain Of The Royal Household. He holds the highest position in the royal household and will be making most of the wedding day decisions. Good news is that Meagan will not have to solve the wedding day challenge of the seating chart, always a family minefield. But in case you were wondering if Meghan is in good hands, I found a photo of the Lord Chamberlain at his own wedding many years ago. What could go wrong? Ok, this tradition I think Meghan would be just fine with. The ceremony takes place at Windsor Castle, just outside London. I have been reading some estimates on the cost of this soiree. Here is what I know... sorta. Markle and Prince Harry's wedding will reportedly cost in excess of $45 million (£33 million), according to Bride Book's estimation. WOW OH WOW. The biggest cost of the wedding is unequivocally the security. If you're thinking how nice for the Royal Family to spend all that personal dough know this, they will pay for the ceremony and celebrations £3m, NOT the big nut the security £30m. That falls straight on the British tax payers. There is a petition going around trying to get them to foot the total bill. Good luck, we know how successful that Stop Brexit Petition was. Windsor Castle ~ Where Prince Harry and Meghan will be getting married. 12. Bride will pay for her dress. 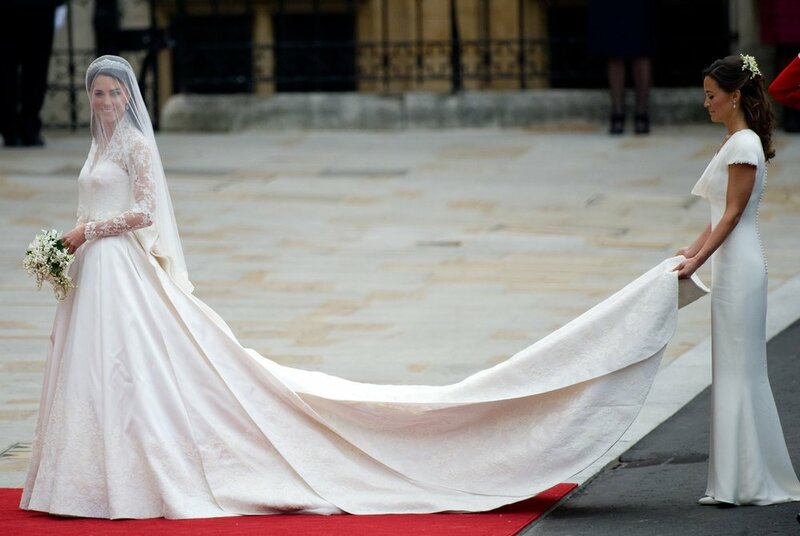 Rumours of the cost of the wedding dress is hovering round £300,000, ($430,000) which is roughly what Kate's Alexander McQueen dress cost her. There is also talk there might be two dresses doubling up her frock budget. One for the ceremony and the other for the evening reception. I mean lets face it, Miss Markel will have no financial woes after she is Mrs Prince Harry. Why not splurge and say yes to the dress(es)? It is also believed that Meghan will be paying for their six figure honeymoon. Guess they paid her well on Suits. 13. The Bride always wears a tiara. Thinking Meghan will adjust to this rule easliy enough. Epsecially if the Queen gifts her a tiara as she did to Diana and Kate. 14. The Groom wears his miitary uniform to the wedding. Got to say, I think we all love a man in uniform As an aside, their uniforms are re-created for the day with sweat-wicking materials in the hopes of keeping them cool and collected as they will not be permitted to undo a single button. Only exception is if the groom is not royal, in which case they sit on the left. You can forget about sucking back oysters at the raw bar this rule was created years ago when they thought there could be a higher likelihood of food poisoning with shellfish. The Queen also forbids any garlic in any of the dishes, and that is just because she can. If you are attending this royal shin-dig you better know how to come dressed. All women must wear a hat at least 10cc wide. So no fascinators here ladies. You are not allowed to take off your hat until the Queen does. That is not likely until the evening reception but that is when you can whip out your tiara you have been saving for such an occasion. Women are also required to wear dresses that cover their shoulders, closed-toe shoes and dresses with hems come no higher than their finger-tips. One luncheon, immediately following the ceremony and the second in the evening that includes dinner, dancing and a more intimate guest list (just 600 people). Prince Harry and Meghan are inviting 2,640 members of the public to the grounds of Windsor Castle to be a part of their special day (standing outside). They will be fed a sausage roll and a cup of tea for their troubles. Sausage roll budget? £23,000! Am I the only one who finds this hysterical? The moment that the Queen sets down her utensils to indicate she is replete all food service is over and the the plates are quickly cleared. So better eat quickly. Also, no one is allowed to leave until the Queen leaves, but she is 92 so I can't see her raving til dawn. Actually no photography of any kind by the guests, and the royals themselves are forbidden to pose for selfies, EVER. It is likely guests will have to surrender their phones and cameras at the castle gates. So I am guessing Tweeting or updating your Facebook status is also a royal no-no. If you're a guest at the royal wedding you will be mailed a piece of the lovely royal wedding cake as a "thank you" for coming. There will be two cakes, one traditional iced fruit cake that generally no one likes (I am guessing this is the one mailed out) and a second of yellow sponge and buttercream. Cake budget... a sweet $71,600US (£52,000). Pastry chef Fiona Cairns with William and Kate's cake. Meghan and Harry have requested that in lieu of wedding gifts that all guests donate money to one of their chosen charities. However... it is likely the Queen, who is very found of giving property as a wedding gift will be the exception. The royal couple most likely will received a "cottage" on the Queen's massive estate of Sandringham in Norfolk. Rumour is the York Cottage (seen below) might be the property the Queen has in mind. Don't you love how the Queen refers to this mansion as a "cottage"? The wedding although expensive to the tax payers is reported that it will have a huge boost on the local economy. According to Britain's Office of National Statistics, the wedding could generate a boost to Britain’s economy by about £500 million ($680 million). The Tourist Authority also predicts the wedding, a worldwide TV event, will trigger a tourism boom that could last several years, eventually pulling in an extra 4m visitors and some £2b into the country. And as no one loves a good booze-up quite like the Brits there are expected to be over 5,500 street parties across the country to celebrate. That's a lot sausage rolls. So cheers to the happy couple. May they survive the fairy tale, slay the dragon, banish the evil step-mother, use Pixie Dust only when absolutely required and treat all Seven Dwarfs with the dignity they deserve.